The true West is defined not by time zones, but by geology, soil, and water. By grasses and sedges, wildlife and openness. Driving west across South Dakota on Interstate 90, as I cross the Missouri River at Chamberlain, the land changes from flat agricultural fields to rolling native prairies. Irrigated, domesticated green gives way to cattle pasture that remains a natural brown on pitches and breaks too steep to plow. I breathe deeply to take in the smell of grasslands. Despite spending an entire day in them driving up from Kansas City, I finally feel the sense of entering into the Great Plains. This is a land of unfolding views, where days are not numbered in the mind but remembered for the weather, for the clarity of the sky, the heat of the sun, and the strength of the wind. Today was a sixty-mile-view day limited only by the curvature of the Earth. I pass the interstate towns of Murdo, Kadoka, Cactus Flats, and Wall, with gas station and hotel economies sustained by the needs of travelers. Other small towns just out of view of the interstate or without exit ramps are abandoned and desiccated. At seventy miles an hour, interstate thoughts are quick. They pass faster than mile markers and are as easily forgotten. Traveling at this speed, everything looks similar, flat, like the parallel lines on the road. But if you take time to slow down, you see that the plains are far from static and monotone, and if you stop for a while, the land changes. Live here for a year and you will appreciate the seasonal cycles of winter and summer and the temperamental periods in between. The dryness and wind that dominate the land keep vegetation low to the ground and flexible. It is ready to sprout with a spring rain, early to reproduce, and then quickly senesce to a gentle brown for the next nine months of the year. Where there is water on the plains, there is intense life and color. Find a pond in midsummer and you will have a pair of marbled godwits swoop down on you with four-inch bills and eight-inch legs, defending their nest. Hear a hummingbird-sized marsh wren singing, more melodious than the nightingale and more wild, with white eyebrows and upturned tail. See black-necked stilts sparring with American avocets on the marsh edge. Hear the whimpering of a Wilson's phalarope as you move past her nest. See a pair of competitive male yellow-headed black birds perching on the small yellow blooms of sweet clover. In a nearby cottonwood tree, northern orioles and yellow warblers will flash their colors as they hang and lunge for insects. There may be house wrens nesting in a rotted-out knot of a tree branch and flickers and downy woodpeckers poking and prodding in its pale, deeply creviced bark. In the willows, evening grosbeaks and yellow-breasted chats may be moving and calling to whoever will listen. Away from the rare river, stream, or pond, the land of the Great Plains is best described by soil and distance from the Rocky Mountains. The rain shadow of the Rockies causes waves of prairie ecotypes: short grass, mixed grass, and tall grass. Farthest west, the sagebrush-dominated high plains of short grass prairie receive as little as ten inches of rain a year, too dry for trees but ideal for grasses that pierce the earth to hold down soil with minute shallow root hairs that can grow sixty miles a day. An irrigated hay field can exhale five hundred tons of water a day, but the economical native grasses of the prairie are adapted to the cycle of water conservation, timing their growth and reproduction to the seasons. I follow the interstate west over the gradual rise of the Black Hills and enter Wyoming. Passing through the gas and coal mining city of Gillette, where a boom in natural gas production has caused a Grapes-of-Wrath style migration of workers from small towns in the Midwest and beyond. Streets are crowded with families who drive new trucks and SUVs but live in shared trailer homes-temporary homes for people who are flush with money from the energy fields but have to wait for construction to catch up with the influx of immigrants. Outside of town, new roads branch out to gas wells in all directions, harshly scraped by bulldozers, looking like varicose veins on the sagebrush steppe. Continuing west, the snow-capped Big Horn Mountains force me to shoot north to Sheridan. By late afternoon I am across the Montana border into Billings, and get off the interstate to take the smaller route US 87. Now heading due north, I pass through the rolling hills north of Roundup, where my friend Mark is stationed as a state trooper. With so few cars and little to do, he would often pull me over when he recognized my truck, so that he could talk of his latest exploit. Last time it was how the week before he finally got to shoot his sidearm in order to finish off a porcupine, half run over and languishing in the middle of the highway. North of Roundup, the prairie opens up for a 157-mile stretch, with the next town being Malta, followed shortly thereafter by the Canadian border. The sun is setting, turning the sky to a fading glow that puts shadows on grasses by the edge of the road. Nighthawks come out on their saber wings to pick off insects that are stirred up by the cooling temperatures and waning light along the roadside ditches. Just after dark, I dip down to the Missouri River, cross the Fred Robinson Bridge, and climb up the hill on the other side. Now within the million-acre Charles M. Russell National Wildlife Refuge, I take the first dirt road east, driving until I know the highway is out of view, and pull over to spend the night in the cab of my pickup. I awake to cool morning air and a flaming orange and pink sunrise. Fingers cold, but not quite numb. I slept in my faded blue jeans. I trade my hiking boots with bent grommets and knobby Vibram soles for flat-bottomed cowboy boots that are worn to fit, slip on easily, and won't cake with mud. No traction needed here. A killdeer cries. Sparrow-sized horned larks battle, black tails flapping. When I step out of the truck, a mixture of western wheatgrass and blue grama crunches under my feet. They are just tufts of dried brown grasses on the surface, but below ground they form a maze of root hairs that teems with mycorrhizal fungi to access nutrients, tap into moisture, and store energy below ground. Root systems have been built and added to over generations so that 75 percent of the prairie's biomass resides below ground, roots that are lost when the prairie is plowed and turned over for row-crop agriculture, the land losing three-quarters of its living biomass in one fell swoop. Scientists have shown that it is not tropical rainforests or arctic tundra but rather temperate grasslands that are among the most quickly declining ecosystems on the planet. In North America, grasslands have the inglorious label of "the most endangered ecosystem." It feels good to be in the middle of one of the largest intact stretches of mixed grass prairie left in the world. I once chose these grasslands over the woman I loved. It wasn't a sudden choice, rather an accumulation of days, weeks, seasons, and years that taught me to get in my car and head to the prairie. A slow burn that led me to value a familiar place above all else. Finding a neat circle of rocks with multicolored red and green lichens that form a circle, I recognize a teepee ring. I feel satisfied that my campsite selection was appreciated by those with deeper blood lines and far greater knowledge of the area than mine. Flat skylines extend in all directions show rolling treeless prairie, with a small patch of hills to the east known as the Little Rocky Mountains, a fine vantage point from which the Gros Ventre could watch out for raiding Assiniboine and Cree tribes. Perhaps it was near a bison migration route, so they could watch and wait for the seasonal movement of the herds from southern Saskatchewan south to the center of Montana, an annual cyclical movement pattern back and forth between summer and winter that had become entrenched, dictated by topography, water, and forage. Following the same path year after year, herds moved north from more mild wintering grounds in perfect timing with the spring green-up of the Saskatchewan prairies. I think of the infinite magnitudes of bison described in the journals of Lewis and Clark and later painted by George Catlin in the 1830s, a time when 25-40 million bison roamed the plains and were the mainstay of regional native tribes, before disease, firearms, and uncontrolled hunting reduced the giants to fewer than a thousand individuals by the 1880s. I had last seen one of those remnant animals in Yellowstone National Park, walking in the open valleys between forested peaks, far from the center of their vast Great Plains home. The last herds were always in fragments, lost from the core. Now the grasslands seem silent and empty without them. When Lewis and Clark traveled along the upper Missouri, they encountered the now-extinct plains grizzly and Audubon's sheep. Wolves still coursed over the prairie chasing elk and bison. Whispers in conservation circles of bringing bison back here evoke feelings of guilt, mixed with hope. Guilt, because of what we have done and that we still need to only whisper. Hope, because beyond regret, there is a selfish and at the same time selfless sense of purpose in righting a wrong accomplished through greed and mistaken assumptions of infinite magnitudes. A sentimental common thread that has continually driven many conservationists to action in the past, and will continue to do so in the future. I think of the group of extremist ecologists who want to go further: to replace extinct North American mammoths, Camelops camels, and Haberman horses that were unable to withstand the Holocene megafauna extinction period caused by environmental change and human hunting. As replacements, they call for introduction of African elephants, dromedary camels, plains zebra, and other surrogate species in a process called "Pleistocene rewilding." By doing so, they would dramatically shift the timeline for conservation from two hundred to ten thousand years ago, making current efforts to reintroduce bison and wolves seem mundane compared to their proposals for elephants and lions. To find justification for their mad plan, one has to look no further than the pronghorn antelope, the swift trademark of the western plains with speed that today seems an evolutionary misfire in excess. But nature is never overly generous without necessity, and it is easy to envision how now-extinct American cheetahs forced the pronghorn to such speeds. After a lifetime of nature documentary scenes of African cheetahs chasing Thomson's gazelles across the Serengeti, I quiver at the thought of seeing a similar scene play out with pronghorn on the Great Plains. The sun finally breaches the horizon, sending out stark white light that bleaches away the oranges of morning. I walk down to a nearby water tank to wash my face. There is the familiar smell of fresh cow manure and exposed dirt. The trampled ground is sparsely covered with grass and sage tufts, grazed by cattle to the smoothness of an old river bottom. Surrounding the tank, brown fluffy prairie dogs sit hunched over, balls of fur warming in the morning light. Clouds the color of gray sagebrush drift overhead. Cold clumsy mosquitoes fly into my hair. A prairie dog cries. Mother to son? Son to sister? Family. Do others listen as well: the badger, the coyote, or the owl? Owls typically hunt at night, but I have seen a great horned owl leave its day perch in a Russian olive tree to swoop down on an unsuspecting prairie dog, squeezing tight and puncturing with sharp talons, forcing wheezy cries and a stream of urine from its prey, lingering on the ground for a few seconds before struggling to fly back to its perch with the two-pound meal. It is not by chance that prairie dogs are here. They seem to hate vegetation more than an inch tall, or anything else that could obstruct their view of an approaching predator. To the distress of golf course managers and cattle ranchers, they thrive on land where intensive mowing or grazing has reduced grasses almost to bare dirt. The close ancestral relationship between prairie dogs and bison as grazing partners likely created a mosaic of prairie dog colonies across the landscape linked to the migratory pathways of bison. Colonies of hundreds of thousands of individual prairie dogs once overlapped those migratory pathways, permanently occupying both the summer and winter ranges while their larger partners moved along. Discovered a Village of Small animals that burrow in the grown (those animals are Called by the french Petite Chien) Killed one and Caught one a live by poreing a great quantity of Water in his hole we attempted to dig to the beds of one of those animals, after digging 6 feet, found by running a pole down that we were not half way to his Lodge. . . . The Village of those animals Covd. about 4 acres [1.6 hectares] of Ground on a gradual decent of a hill and Contains great numbers of holes on the top of which those little animals Set erect, make a Whistleing noise and whin allarmed Step into their hole. we por'd into one of those holes 5 barrels of Water without filling it. Those Animals are about the Size of a Small Squ[ir]rel . . . except the ears which is Shorter, his tail like a ground squirel which they shake &amp whistle when allarmd. the toe nails long, they have fine fur. Prairie dogs, along with magpies, were among the only living things Lewis shipped back to President Jefferson in 1805 from Fort Mandan, where the expedition stopped for its first winter. Despite the long trip, prairie dogs were robust enough to survive from North Dakota to Jefferson's desk at Monticello. Jefferson kept one prairie dog as a pet for a time before passing it on to Charles Wilson Peale's museum in Philadelphia, where it lived out its days as an attraction symbolizing the novel and unknown American West, then was stuffed as a curiosity for decades more, and finally was lost in a fire. For all their interest in prairie dogs and other wildlife, Lewis and Clark never observed a black-footed ferret. Indeed few European explorers had seen them other than as pelts used by indigenous people. Spanish Explorer Don Juan de Oñate was perhaps the first European to describe the species in 1599 while exploring the future southwestern United States: "It is a land abounding in flesh of buffalo, goats with hideous horns, and turkeys; and in Mohoce [center of the Hopi nation near present day Walupi, Arizona] there is game of all kinds. There are many wild and ferocious beasts, lions, bears, wolves, tigers, penicas, ferrets, porcupines, and other animals, whose hides they tan and use." Although Oñate could have been describing bridled weasels or other weasel species known to exist in the region, ferrets were likely present in the area. People of the Blackfoot, Cheyenne, Crow, Hidatsa, Mandan, Navajo, Pawnee, and Sioux nations have all used black-footed ferret hides in the making of skins for headdresses, medicine pouches, tobacco pouches, or other sacred tribal objects. They also have had distinct names for ferrets that illustrate their familiarity with the species and its biology. The Sioux called ferrets pispiza etopta sapa, translated to "black-faced prairie dog," illustrating their knowledge of the key link between ferrets and prairie dogs. The Pawnee called ferrets "ground dogs" in one of their mythical stories where the ferret speaks of itself as "staying hid all the time," which shows the Pawnee's familiarity with the reclusive nature of ferrets. Fur trappers during the early 1800s also were familiar with ferrets and differentiated the species from other Mustelids (the family of mammals containing stoats, mink, wolverines, otters, and other weasel-like elongated carnivores) before scientific discovery and classification. Pratte, Chouteau and Company of St. Louis, better known as the French Fur Company (and later as the Western Department of the American Fur Company) concentrated their fur acquisition efforts in the "Sioux country" of the upper Missouri River basin encompassing most of present-day Montana, Wyoming, and South Dakota. They listed eighty-six black-footed ferret pelts received between 1835 and 1839, a taxonomic distinction not yet known to science, but that the trappers noted apart from "weasels" on their ledger. It was trapper Alexander Culberson who first brought black-footed ferrets to the attention of the eminent naturalist John James Audubon. John Bachman and Audubon provided the first scientific description of the species in 1851, based on a specimen collected near Fort Laramie, Wyoming. Unfortunately, this original specimen was lost, and the validity of Audubon's discovery was questioned by naturalists for the next twenty-five years. Even with the pedigree of Audubon supporting its existence as a species, the validity of the reclusive ferret of the Great Plains remained a topic of debate until 1877, when Smithsonian curator Elliot Coues was able to procure several additional specimens to confirm Audubon and Bachman's classification. This debate persisted despite the fact that prairie dogs, on which black-footed ferrets rely, were likely to have been one of the most abundant mammals in North America at the time. Naturalist C. Hart Merriam noted the abundance of prairie dogs when he made transcontinental train journeys across the Great Plains in the late 1800s. He wrote that "the traveler who looks out the car window by the second day west from Chicago is sure to have his attention arrested by colonies of small animals about the size of cottontail rabbits." Merriam noticed that they had become tame to the sounds and sight of the onrushing train, staying above ground long enough for him to take notes on their colonial life and make observations on their social behavior. He reported on their elaborate burrow structure, their seasonal cycle of activities, their warning calls to others, and the species that preyed on them. Merriam reported hearing of a colony in Texas estimated to be twenty-five thousand square miles in size, and based on the density of burrow openings, he deduced that it contained 400 million prairie dogs. At a continental scale, he postulated that prairie dogs had an inflated abundance "due to the coming of the white man" who "cultivates the soil and thus enables it to support a larger number of animals than formerly." Although intensive grazing of the grasslands by overstocked exotic cattle created a more open prairie that might have allowed prairie dogs to increase in numbers, the species was always abundant across the Great Plains, even prior to westward invasion by the "white man." Prairie dogs had been in the Great Plains for millions of years prior to Lewis and Clark's expedition, with fossil records dating back to the late Pliocene epoch of 2.5-1.8 million years ago. It was the high abundance of these uniquely New World rodents that allowed for the evolution and speciation of one of the world's most specialized carnivores, the black-footed ferret. Similar to bison and many other New World mammals, black-footed ferrets can trace their predecessors back to Europe and Asia. The precursor to the modern black-footed ferret, a now-extinct subspecies of the steppe polecat (Mustela eversmanii berengii), followed the Bering land bridge from Asia to North America. Slowly spreading southeast from modern-day Alaska through ice-free corridors, this ancestral ferret was present in the Great Plains as early as eight hundred thousand years ago. From the specialized beaks of Darwin's finches to the cryptic partnerships between flowers and their uniquely dependent pollinators, ecologists have always loved to study specialization-the ability of species to adapt and form a dependence on a specific set of conditions. Over time, this new set of specialized adaptations can become so advanced that it forces a species to diverge, become unique, eventually forming a separate species. In this way, specialization itself is the foundation of biodiversity, but to be able to specialize requires three things. First, there must be an advantage to specializing, to doing one thing better than any close relative. Second, the selected advantage must be heritable and able to be passed down through generations. Finally, there must be stability in the advantage so that the plusses and minuses of reproduction and survival favor the specialist over its competition. The prairie dog populations of the Great Plains provided the perfect medium for specialization of the black-footed ferret. They offered an abundant and stable prey source that allowed some ferrets to begin to shift their diet from a range of small rodents similar to those found in Asia and Europe to the larger prairie dogs of North America. Further, the intricate burrow systems of prairie dogs served as sufficient shelter for these prairie-dog-hunting specialists. With both food and shelter available, these early black-footed ferrets found no need to leave prairie dog colonies and interact with their ancestral predecessors, and by as early as thirty-five thousand years ago, the black-footed ferret (Mustela nigripes) was morphologically distinguishable from Mustela eversmanii berengii. Speciation had occurred, producing the highly adapted black-footed ferret that has been able to persist long after its generalist polecat predecessor has gone extinct in North America. As first chief of the Biological Survey (later to become the present-day U.S. Fish and Wildlife Service), Merriam focused his interest on patterns of species distributions in North America, which he mapped as "life zones" or biomes. On first observing how prairie dogs and their distribution coincided with prairie grasses but avoided belts of trees in stream valleys, he found support for his theory, musing that prairie dogs were "an important illustration of the law that in fixing the limits of distribution of animals climatic factors are even more potent than food." Merriam also had thoughts as an early conservationist, even contradicting the original intent of the Biological Survey, which was to provide information on birds and mammals that were agricultural pests. In his 1896 report to Congress, he opposed the "pernicious effects of laws providing bounties for the destruction of mammals and birds." He did not, however, extend these sentiments to prairie dogs. His 1902 report entitled "The Prairie Dog of the Great Plains" reflected public pressure from the rapidly growing number of western farmers and ranchers. In this seventeen-page report, he institutionalized a view that has largely persisted since: that prairie dogs are a rangeland "scourge" that must be eradicated. By the late 1800s farmers and ranchers had moved into the plains in such numbers that land holdings were decreasing in size, and grass losses due to prairie dog herbivory were "more keenly felt." Merriam postulated that prairie dogs resulted in the loss of 50-75 percent of the production capacity of a piece of land for livestock (a figure widely discredited in the years to come). This assessment, combined with the view that prairie dogs were abnormally expanding their range following western settlement, led western states to develop policies and programs for the complete elimination of prairie dogs. Texas and Kansas even went so far as to adopt legislation around 1900 that stipulated fines for landowners who failed to exterminate prairie dogs on their land. Because of the low price of strychnine and the financial repercussions of inaction, prairie dogs were removed from large portions of Texas, Kansas, and other states throughout the West. Even after millions of acres of prairie dogs on private farms and ranches had been eradicated, there were still complaints about prairie dogs on government lands where private landowners leased grazing rights. Merriam referred to this situation as a "very serious evil" for private landowners, "and one with which it is exceedingly difficult to cope." The federal government, with what Merriam termed "universal support," started to investigate efficient ways to "combat the evil" on private and public lands. Prairie dog eradication changed from a backyard occupation to a federally funded campaign. The government purchased and applied poison grain laced with strychnine and provided subsidies for ranchers to do so on a colossal scale. More recently, strychnine was replaced by 1080, zinc phosphide, and Rozall, but the effect was just as lethal. After treatment, sites were revisited to ensure a complete kill. Stragglers were knocked out with targeted burrow application of bisulfide, pyrotechnic gas cartridges, cyanide flakes, or a homemade concoction called "Hoky poky on cobs." Prairie dog poisoning became a full-time job for thousands of people. Eradication was a sure-fire campaign platform for any governor or congressman in a prairie state. Poisoning was both politically popular and well funded in order to remove an "impediment to the economic development of the west." Between 1915 and 1965, western states eliminated more than 37 million acres of prairie dog towns, driving populations to less than 5 percent of their former range. They left only small, overlooked pockets of prairie dogs in the back corners of a few expansive ranches, public grasslands, and tribal lands. These pockets today continue to be targeted by government-sponsored poisoning campaigns, with only some small populations being managed in protected environments. I return to my truck and leave the prairie dogs to start their day. I find in the bottom of my backpack a granola bar, oats and other grains molded into a snack that is thankfully strychnine free, and think of C. Hart Merriam as I eat my breakfast. Reading his 1902 article, I thought that Merriam sounded interested in the ecology of prairie dogs. He seemed almost fond of prairie dogs when he referred to the black-footed ferret as "one of their [prairie dogs] most relentless and terrible enemies, and if sufficiently abundant would quickly exterminate all the inhabitants of the largest colonies." Yet his document now can be seen as a masterful piece of political propaganda aimed toward securing funding for his agency through prairie dog eradication. I wonder if he ever realized, or possibly regretted, his role in forever shifting public opinion of prairie dogs as a symbol of the West to that of a pest. Even the founder of modern wildlife management, Aldo Leopold, originally subscribed to the eradication view for a time, shooting wolves on sight in the Gila National Forest of New Mexico where he was a forest ranger. Yet one day while staring down at a wolf he shot and seeing the "green fire" extinguishing from its eyes, he had a vision for the future that would forever change the way we view and manage wildlife. Leopold's feelings of sentimentality and mourning brought about the birth of a land ethic and greatly advanced the conservation movement. Unfortunately, C. Hart Merriam did not have a similar vision for wildlife. History now remembers him as man after whom several wildlife species were named, many now extinct, with the most notable exception being a subspecies of turkey. Today, natural selection seems to favor the generalist: the raccoon or dandelion that persists in the city, suburbs, and national park; the grub that can feed on multiple backyard plants rather than be restricted to one, thereby minimizing its vulnerability to the plight of a single bush. As the human footprint expands and homogenizes the landscape, specialists are often those rare holdovers we both marvel at and want to conserve-species like the panda of the bamboo forests in Asia, desert pupfish of small pools in the deserts of the southwestern United States, and the oyster mussel of clear Appalachian streams, that are at the top of many conservation priority lists as the species at greatest risk of extinction. Just as ecological theory would predict, the decline of prairie dogs has been accompanied by the decline of their specialist predator. Black-footed ferrets have always been cryptic and difficult to find, but by the mid-1900s they were becoming exceedingly rare. In the span of less than a hundred years, the black-footed ferret would go from the high status of being the most effective specialists in North America to one of the most critically endangered animals in the world. By the late 1960s and early 1970s ferrets would become known not as the "most relentless and terrible enemy" of the prairie dog, but-thanks to legal protection afforded them under the Endangered Species Act-as the saving grace for their prey species. Endangered predators relying on declining prey, the ferrets became the bellwether of healthy, large prairie dog colonies on the handful of sites where they still existed. I look out the truck windshield past the prairie dog colony I had just left. In the distance I see a series of other small colonies on benches leading down toward the Missouri River. They are just patches of bare ground and burrows on the flat tops of hills separated by narrow draws where I know that at least a handful of prairie dogs would be coming above ground for the day. Through government protection and proactive restoration, prairie dogs have persisted here over time. It is a small victory in the long-term battle to save the few last pieces of intact native prairie. I hope that someday, in my lifetime, we might be able to restore ferrets back here. To have the rarest eat the rare. It would take me hours to get anywhere with a name on the map, but I am in the middle of everything. By telling one story of conservation biology in practice—its routine work, triumphs, challenges, and inevitable conflicts—this book gives readers a greater understanding of the conservation ethic that emerged on the Great Plains as part of one of the most remarkable recovery efforts in the history of the Endangered Species Act. David S. Jachowski is a lecturer and postdoctoral research associate in the Department of Fish and Wildlife Conservation at Virginia Polytechnic Institute and State University. From 2002 to 2012, he was a wildlife biologist with the U.S. Fish and Wildlife Service, helping to coordinate national and international recovery efforts for the black-footed ferret. His scientific work is published in leading peer-reviewed journals such as Frontiers in Ecology and the Environment and Biological Conservation. 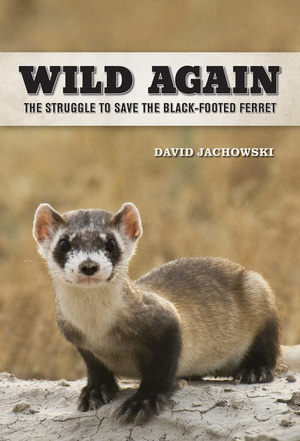 "In Wild Again, Jachowski does for the black-footed ferret and the Great Plains what Edward Abbey did for our deserts: illuminates their elegant wonder, exposes their secrets and rare beauty, and transports them front and center into our national conservation conscience." "This beautifully scripted book by David Jachowski addresses fundamentally important issues about grasslands, biodiversity, and people. Wild Again is not only modern and pithy, but it also tells a story about commitments to conservation using charismatic animals. Anyone who wants to understand how to do conservation and appreciate why biology matters needs to start here."